A fruit that is a cross between a melon and a cucumber. 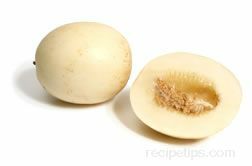 It is native to southern Africa and grown in the United States, Portugal and New Zealand. The outer flesh has distinctive spikes or horned protrusions that are responsible for this fruit also being referred to as the horned melon. 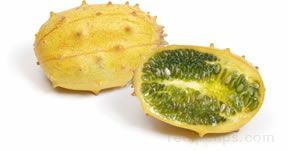 The word Kiwano was derived from New Zealand where the fruit was named for its resemblance to the kiwi, with its bright green inner flesh that is jelly-textured and filled with soft flat edible seeds. When eaten raw, it has a flavor that may be considered the same as a cucumber and melon combined, with a slight taste of banana and lime as well. When ripe, the outer skin of the melon should be orange-yellow in color and firm to the touch. It can be prepared for use in salads by removing the outer skin and slicing the inner flesh into squares or slices. Or it can be used as a salad dressing, by whisking the flesh with a little olive oil and substituted in place of vinegar. Scooping out the flesh and blending it into a drink, and then adding other ingredients such as yogurt, sorbet, honey or vanilla ice cream is another way of preparing it. 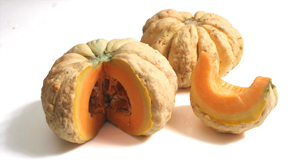 The flesh can also be added to soups or sauces to provide a delicious fruity flavor. When entertaining, the scooped out shell can be filled with ingredients to create a colorful and unique presentation. For storage, the melon can be kept at room temperature for several weeks, or to enhance the flavor, store in a refrigerator and serve shortly afterward.